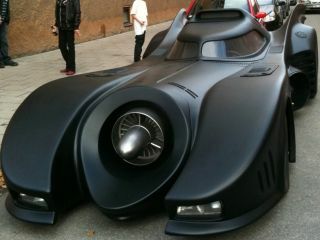 A Swedish amateur mechanic has created the ultimate boys' toy – a replica of the Batmobile. Taking his inspiration from the Batmobile which ferried round Michael Keaton's Batman in Tim Burton's 1989 version of Batman, the replica is full-sized and equipped with more gadgetry than you can shake a batarang at. Included within the Batmobile's uber-cool chassis is a plasma TV, DVD player and a video camera so you can see Joker's goons coming at you from around the corner. Oh, and did we mention it also houses some machine guns and voice recognition? Well, it does so this is one car not to be messed with. And when it comes to actually driving the thing, the car – which is designed around a Lincoln Continental – packs an engine with 700 horsepower, which is the equivalent to a BMW M 536. This has been a labour of love for the unnamed owner, who apparently spent $1 million and 20,000 hours building the thing. Lucky for us, some lucky person spotted the Batmobile replica on his way to work in Stockholm and decided to film the car and put it on YouTube. Prepare for your eyes to melt.